My breakfast is included in my $10 room rate but Mauro brought me to the restaurant next door. Before I could protest, he had already ordered desayuno for me: a mug of tea, slices of toast and a small plate of jam and butter. No worries, it's libre. Mauro meant that breakfasts are really taken in this restaurant. I'm not sure though if this restaurant is part of Hostal Don Victor but if my breakfast is free, why do I have to bother? I was picked up on time by a van already brimming with young day-trippers to the islands. Good, this is my kind of company. Mauro deserves a pat in the back for hooking me up with Expresso Inka Tours, the company that will send me and these other twenty-somethings to the fabled islands of Uros and Taquile today. We boarded the boat at a jetty by the lakeshore. From here, the water had a patina of green. Calixto, our groovy Peruvian guide, told us that we're seeing green in the water because of the algae infiltration near the lakeshore. As we sailed further into the lake, the water turned clearer. 30 minutes later, reeds, reeds and more reeds came into view. The boat slowed down and soon, we were in the midst of the floating islands of the Uros people. 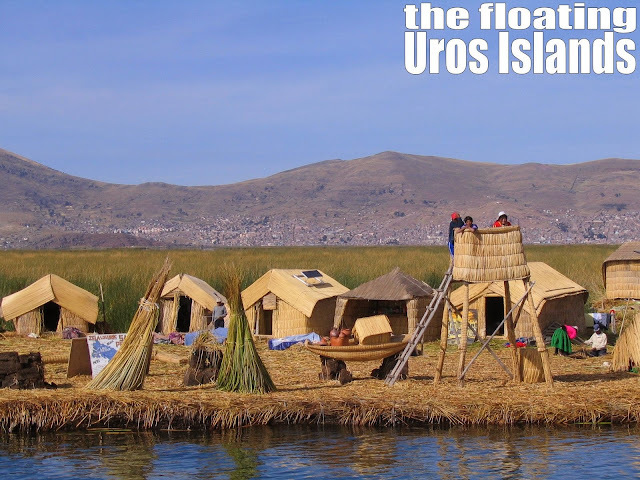 The Uros have lived for ages along the shores of Lake Titicaca but fear of cultural invasion from the Aymaras and the Incas motivated them to isolate themselves by constructing islands out of totora reeds that grow abundantly on the lake, hence the name Uros islands. Our boat docked in one of the 32 or so islands and was immediately "mobbed" by the islanders. I have this funny feeling that this arrangement was another tourist entrapment as I see women in traditional costumes hastily bringing out their goods for sale. There were also goods they sell that couldn't have been produced on these islands--- a carved wood for instance. I did manage to buy later on a scale model of their local totora boat made from actual totora reed. That is at least a product genuinely sourced from the lake. As I walk around the island, I feel my foot sinking a little bit with every step. It's like stepping on a giant mattress. The Uros people have to continuously stack more reeds on the surface of the islands as the old ones rot underneath. I was careful as I walk around for fear of stepping into a rotten part and disappearing into the water below - who knows? We took a ride on the carefully constructed totora reed boat for 5 soles each and ended up on another reed island where our boat and Calixto met us up. Those who have more time can actually stay here as there are accomodations available just like those of the islanders. As we sailed on towards the more remote island of Taquile, I began to notice the immensity of Lake Titicaca. It felt more like we were sailing in the open sea except that mountains jut out in the horizon. After about two hours, we reached Taquile, an island with around 2,000 Quechua-speaking inhabitants, roughly 15 kms long and 1 km wide. We walked up a trail that led us to a village square. Women here wear brightly colored skirts and covered themselves with black headscarves. Men wear traditional chullos, woolen caps that suggest marital status depending on the color being worn. Lunch was fried trucha at a villager's home whose frontyard was turned into an alfresco restaurant. Calixto had us walking once more until we reached the side of the island where we earlier started. We got back into the boat and reached the boat docks again at 5:30 p.m just before sunset. 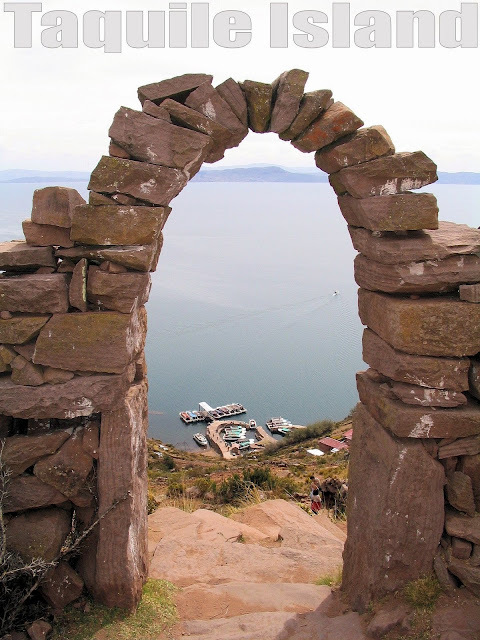 Locals in groups and in pairs were walking down the promenade fronting the lakeshore - perhaps to breathe some fresh air or just bask in the beauty of Lake Titicaca. 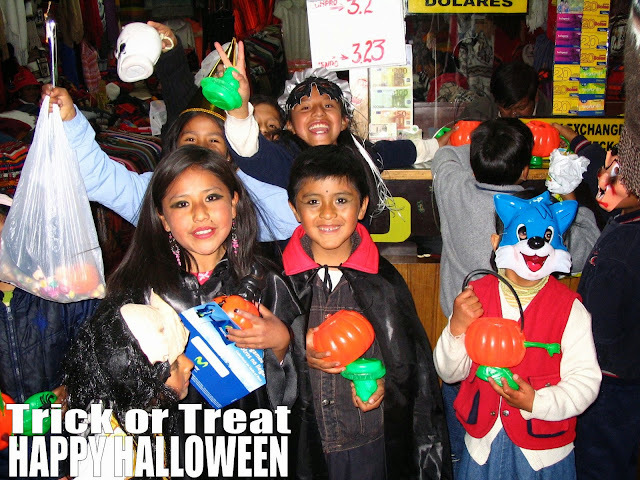 This day being Halloween, people in Puno were in a party mode. I managed to catch the tail-end of a parade down into the Plaza de Armas. Kids wearing their Halloween costumes with their moms in tow were, to my surprise, actually doing a "trick or treat" around town! I was waiting for my take-out order at Ukuku's Pizzeria when two masked kids came up to me with their pumpkin basket. Not having any chocolate or candy with me (how would I know that Halloween is being celebrated American-style here? ), I brought up some Peruvian coins which I tossed into their baskets. Happy Halloween from South America!